Research shows that facility administrators, owners and maintenance professionals who inspect and repair their commercial rooftop on a regular schedule spend only 14 cents per square foot, versus 25 cents per square foot for those that don’t. That’s 44% savings just from performing basic proactive maintenance on your rooftop! What’s more, a proactively cared for roof lasts around eight years longer than one fixed on an as-needed basis. A dirty or cluttered roof may also have damage that you don’t see. Consider these 3 proactive approaches to commercial roof maintenance and avoid costly rooftop problems. Inspect the exterior, looking for obvious signs of deterioration of the fascias, gutters and soffits. Inspect the interior of the building for signs of water damage or structural anomalies that might pertain to the roof. Ponding can lead to premature aging of the roof and deterioration. Standing water also adds weight to the roof, weakening the structure. Inspect the roof cover looking for bubbles. Bubbling is a sign that moisture is getting trapped just under the roof cover or that the insulation board is releasing gas. Walk around the edge of the roof, evaluating the condition of the flashing. Gaps in the flashing can lead to roof failure. Look for tears or cracks in the roof cover that indicate wear. Check the drains, vents and skylights to ensure they remain sealed and functional. As you walk around, clear any visible debris, including overhanging branches, leaf buildup and clutter on the roof. 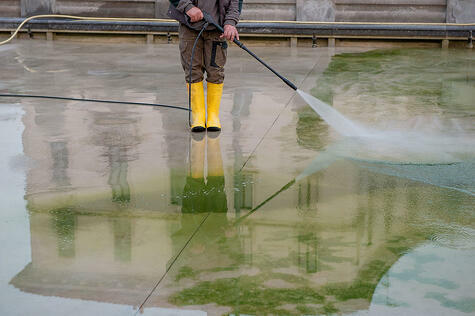 Prepare the rooftop for cleaning by protecting areas water might enter such as base flashings or low curbs. You will also want to protect the surrounding landscaping from run off. Start by rinsing the roof surface with a low-pressure power washer. Use a tool with 2,000 psi or lower pressure. Apply a mild, non-abrasive cleaning solution to the surface with a soft-bristled, long-handled brush. A mix of a household cleaner and water in a bucket is suitable. Ask your roofing supply vendor what cleaner is best for your roof surface. Rinse the cleaner and dirt off the roof with the pressure washer. Inspect the clean membrane for damage and make necessary repairs. Double-check any gutters, downspouts and drains to ensure there is no blockage after cleaning. Signing a general maintenance agreement with a professional roofing company eliminates the hassle of regular inspections and care. Trained professionals can spot problem areas before there is damage and find solutions to protect one of your buildings most valuable assets. A roofing company can do repairs the right away, too, so there is no need to pay for a second inspection prior to getting the roof work done. Proactive roof maintenance allows you to find roofing solutions and avoid expensive problems. Whether your staff handles it or you hire a roofing professional, inspection and cleaning should be an integral part of your plan.